As I predicted yesterday, Cyprus managed to hammer out an agreement with its international lenders, thus averting a banking collapse (although its offshore-banking franchise has been irreparably harmed). This morning's opening suggests instead that investors are cheering the result, with the S&P 500 and the narrower, price-weighted Dow Jones Industrial Average up 0.5% and 0.32%, respectively, at 10 a.m. EST. The S&P 500's record (nominal) high of 1,565.15 of Oct. 2007 could well fall today. *Estimated. Source: Investment company documents. These funds were no doubt burned by the meltdown in bank shares during the financial crisis, and they are tremendously conservative organizations. Both of these factors create inertia in the decision-making process, and as such, these funds' holdings can be thought of as lagging indicators of performance. Once their holdings in B of A and Citi reflect (or exceed) the allocations dictated by their benchmarks, the shares will have run. The funds themselves, because of their massive footprints, will have played a big role in sparking that outperformance. Investors who stay one step ahead of them can reap the returns. Bank of America's stock doubled in 2012. With significant challenges still ahead, it's critical to have a solid understanding of this megabank before adding it to your portfolio. In The Motley Fool's premium research report on B of A, analyst Anand Chokkavelu, CFA, and Financials bureau chief Matt Koppenheffer lift the veil on the bank's operations, detailing three reasons to buy and three reasons to sell. Click here now to claim your copy. 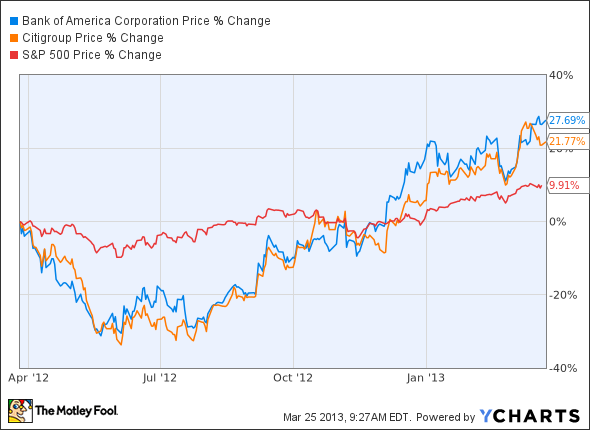 The article Bank of America and Citigroup Can Still Outperform -- Here's Why originally appeared on Fool.com. Fool contributor Alex Dumortier, CFA has no position in any stocks mentioned; you can follow him on LinkedIn. The Motley Fool owns shares of Bank of America and Citigroup Inc. Try any of our Foolish newsletter services free for 30 days. We Fools may not all hold the same opinions, but we all believe that considering a diverse range of insights makes us better investors. The Motley Fool has a disclosure policy.